According to the Centers for Disease Control and Prevention, each year 1.5 million Americans experience a traumatic brain injury (TBI). In addition, it is estimated that 5.3 million Americans live with disabilities resulting from a brain injury. Motor vehicle crashes, violence – mostly from firearms – and falls, particularly among the elderly, are the three leading causes of TBI. Twice as many men incur a TBI than women and people ages 15 to 24 years and over age 75 are the two age groups with the highest incidence of traumatic brain injuries. TBI’s occur eight times more frequently than breast cancer. Traumatic brain injuries can be from either closed or open head injuries. A closed head injury occurs when the brain bounces against the skull. Closed brain injuries could affect a specific area of the brain or be diffuse and affect many areas of functioning. Depending on where the brain is injured, physical, psychological and/or cognitive limitations may occur. An open head injury occurs when something penetrates the skull and subsequent limitations are usually focused on the location of the penetration. 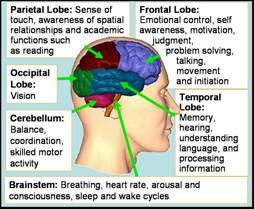 The figure below describes the primary functions of the different areas or lobes of the brain and the brainstem. No two individuals will be affected in the same way by a traumatic brain injury. The actual damage to the brain, the length of time in a coma, the length of time having memory difficulties after the injury, the personality and learning style before the injury, the emotional reaction to the injury, and the social supports will all determine changes in personality, or physical or mental abilities. Traumatic brain injuries are frequently referred to as a “silent epidemic” because of the invisible nature of this disability. Symptoms not readily apparent, such as loss of memory or initiative, often lead others to misunderstand and misinterpret the injured person’s actions and abilities. The person with the injury may also be grappling with newly acquired difficulties, which often lead to frustration and confusion. The frustration and confusion may cause a loss in self-confidence, feelings of failure, depression, anxiety or a sense of lost control. Agriculture ranks as one of the most hazardous industries. By the very nature of production agriculture, there are implied risks of secondary injuries. Assisting the person with a TBI function independently and safely on the farm or in the home will require taking into account the following factors: medical assessments of disability, observations of the farmer with TBI, feedback from his/her support system and assessment of the physical and cognitive demands of the agricultural operation. Assessments from medical professionals will identify the nature and severity of the limitations associated with the farmer or rancher’s specific brain injury. Getting to know the person over time through interactions and observations should provide an understanding of how the person perceives his/her limitations and how he/she functions within them. Feedback from significant family members or support people may be useful in understanding the individual’s overall functioning level. An assessment of the physical, sensory, and cognitive demands of the agricultural operation, coupled with barriers imposed by the disability, will identify where assistance may be beneficial. Safety and avoidance of secondary injuries when returning the farmer or rancher with a TBI to production agriculture are the primary objectives of the AgrAbility projects. When suggesting alternative ways of performing farm tasks, and/or modifying equipment or systems, one must consider the farmer’s limitations as well as his/her willingness to try new methods or relinquish duties that he/she has done in the past. Many hard issues will need to be addressed. Will the person be able to safely handle operating agricultural equipment, work with livestock and manage seasonal peak workloads? If the farmer can drive a car, can he/she safely operate a tractor or run a combine? Is the farmer’s reaction time adequate to handle unpredictable animals? Is endurance or fatigue an issue that would preclude being able to work the long harvest hours? Some individuals develop their own compensations or strategies while others may require assistance or more complex accommodations. The following sections will describe a few simple adaptations for cognitive/memory, perceptual/spatial, motor/physical, and emotional limitations caused by a brain injury. Simple farm tasks can suddenly become insurmountable hurdles for farmers with brain injuries affecting cognitive functioning. Short term memory loss, inability to problem solve, difficulty processing information, poor judgment, trouble initiating activities and even reading may vary in severity, frequency and circumstance. Therefore, it is important to observe and work with the individual over a sufficient time period to understand their abilities. A good first step is to assess the cognitive demand of each problematic farm task. This could be accomplished within a work site assessment. Finding solutions to problematic tasks the farmer must perform will typically find better acceptance if the solutions are unobtrusive or similar to what others in agriculture already use. For example, for a dairy farmer, it would be easy to hang a clipboard on the parlor wall listing all of the routine tasks he/she might encounter each time he/she starts up, runs, and cleans up the parlor. The farmer can then visually or physically check off tasks in the order that they are to be completed. This same clipboard could include the manufacturer’s service numbers for the vacuum pumps and the milking equipment, or contact information for on-call hired hands. This low-tech solution is similar to what any “dairy” farmer might use. Another solution is an ordinary paper wall calendar that could be used to track information about the farmer’s herd. If the farmer has difficulty in initiating a task or remembering to look at the list on the clipboard, memory aids such as a vibrating watch or alarms with auditory information can help to remind him/her that it’s time to do another task on the list. More information on memory aids will be included in the forthcoming tip sheet. Routine maintenance of farm equipment is a common work task. Using the operator’s manual, or having a picture of a particular piece of farm equipment with all the lubrication points highlighted in an appropriate color, might lessen the possibility of a gear or bearing not getting lubricated. Most farmers/ranchers would use the operator’s manual until they were familiar with the machinery. Color-coded scoops, barrels and pictures may also help when feeding animals that require specific types and amounts of feed. Again, these are common solutions to routine farm tasks using available or adapted materials to meet the particular needs of the farmer with the TBI. Non-routine tasks occur all the time. Carrying a simple pocket notebook with a “to do” list may be sufficient as a reminder tool. However, non-routine tasks, or tasks which if done improperly have the potential for serious safety issues or other implications, may require different strategies. Farm equipment breakdowns or the weather can alter the best of plans, causing difficulty for all farmers and ranchers. Therefore, it’s impossible to list all the steps required to handle every non-routine farm/ranch task in these situations. Having a co-worker work alongside or in place of the individual with TBI with cognitive issues may be preferred. For individuals with a brain injury affecting spatial relationships, coupled with other limitations, the operation of farm machinery becomes a very serious issue. Even in the wide-open western plains, a tractor or combine operator must be able to judge distances and maintain proper machine alignment with the field operation or crop harvesting activity. The simple task of backing a tractor to hitch it to equipment requires the operator to judge close distances with good reaction timing. The use of automated hitches might lessen the chance of injury to the operator or co-workers who attempt to handle a wagon tongue during hitching. Likewise, low technology solutions such as additional end-of-header markers, contrasting color fence posts around the fence gate or contrasting color added to drive-through gates may improve spatial acuity for the equipment operator. In point of fact, operating a tractor or combine is not the same as an automobile. If there are serious concerns about safety and ability to operate agricultural equipment, discuss them with the farmer with the TBI. Suggest that others handle the equipment operation, if feasible. Medical professionals may recommend that the farmer with the TBI, who has balance, coordination, and/or motor skills difficulties, not climb ladders, silos, grain bins, or walk on highly uneven surfaces in order to prevent slips and falls. In some of these cases, ladders can economically be replaced with stairs. As an example, stairs could be added to grain bins. Or, the necessity to climb a grain bin can be reduced or lessened by installing a grain bin level indicator. In an upright silo, adding stairs isn't practical, and in this situation, it may be better to have someone else perform the task. Loss of balance, coordination, slowed reaction time and other motor skills limitations may pose problems working with livestock. Even though the farmer and cattle are familiar with one another, unexpected events such as a simple “tractor-backfire,” an unexpected dog barking, rooster crowing, etc., may startle livestock and place the farmer in a precarious or “trapped” position. To limit or prevent such situations, proper handling techniques for all types and kinds of livestock should be assessed. Even small calves can present a great danger, and the use of head gates or squeeze chutes to properly and safely restrain livestock are good investments. They could help prevent primary injuries for all livestock farmers/ranchers. Other physical symptoms experienced by the farmer with the TBI may be similar to someone who has suffered a stroke. The AgrAbility Quarterly on Strokes, Spring, 2002 offers strategies and solutions, which may be beneficial. If a farmer experiences a lack of emotional control, impulsivity, depression, or anger, medication and counseling can be helpful. Regular aerobic exercise and structured activities, such as work or volunteer responsibilities, can help to increase self-esteem and feelings of self worth. Having a structured and well organized home and work environment also increase the predictability and control the person will have in the day-to-day activities of living.